Mister Rogers arrives with two toy balls which have split open. Rather than throw them away, he takes them to the sand table where he uses the the pieces to form mounds of sand. He thinks about American Indians who use sand to create artwork. In the Neighborhood of Make-Believe, Daniel Striped Tiger is playing with Prince Tuesday in a sandbox at the castle. When Mr. Allmine attempts to take the sandbox, he is stopped by Handyman Negri. When Mr. Allmine flees, a group sets out in the royal plane to search for him. Arriving in the Land of Allmine, they find Mr. Allmine as well as Daniel's missing clock. When they are asked to leave, King Friday agrees under the condition that Mr. Allmine come to Make-Believe tomorrow to discuss the clock's return. Back at the house, Mister Rogers visits Brockett's Bakery where Chef Brockett and Jose Cisneros are making a drink with pineapple and carrot juice. Chef Brockett talks about working at regularly at the gym. 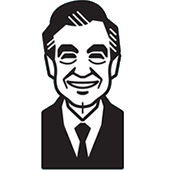 Returning to his house, Mister Rogers sings I Like To Be Told. Look and Listen plays in the background as Mister Rogers goes to Brockett's Bakery. The juicer used in this episode was originally delivered to Chef Brockett by Mister Rogers in Episode 1305.